Apocalyptic and post-apocalyptic fiction is a subgenre of science fiction, science fantasy or horror fiction literature in which the Earth's technological civilization is collapsing or has collapsed. The apocalypse event may be climatic, such as runaway climate change; natural, such as an impact event; man-made, such as nuclear warfare; medical, such as a plague or virus, whether natural or man-made; or imaginative, such as zombie apocalypse or alien invasion. The story may involve attempts to prevent an apocalypse event, deal with the impact and consequences of the event itself, or it may be post-apocalyptic, set after the event. The time frame may be immediately after the catastrophe, focusing on the travails or psychology of survivors, the way to maintain the human race alive and together as one, or considerably later, often including the theme that the existence of pre-catastrophe civilization has been forgotten (or mythologized). Post-apocalyptic stories often take place in a non-technological future world, or a world where only scattered elements of society and technology remain. Various ancient societies, including the Babylonian and Judaic, produced apocalyptic literature and mythology which dealt with the end of the world and of human society, such as the Epic of Gilgamesh, written ca. 2000–1500 BC. And recognizable modern apocalyptic novels had existed since at least the first quarter of the 19th century, when Mary Shelley's The Last Man (1826) was published. However, this form of literature gained widespread popularity after World War II, when the possibility of global annihilation by nuclear weapons entered the public consciousness. 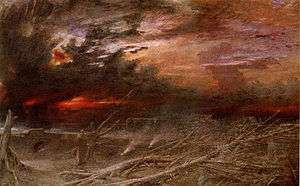 As shown above, the apocalypse is also depicted in visual art, for example in Albert Goodwin's painting Apocalypse (1903). The apocalypse event may be climatic, such as runaway climate change; natural, such as an impact event; man-made, such as nuclear warfare; medical, such as a plague or virus, whether natural or man-made; or imaginative, such as zombie apocalypse or alien invasion. The story may involve attempts to prevent an apocalypse event, deal with the impact and consequences of the event itself, or may be post-apocalyptic, and be set after the event. The time frame may be immediately after the catastrophe, focusing on the travails or psychology of survivors, the way to maintain human race alive and together as one, or considerably later, often including the theme that the existence of pre-catastrophe civilization has been forgotten (or mythologized). Post-apocalyptic stories often take place in a non-technological future world, or a world where only scattered elements of society and technology remain. Numerous societies, including the Babylonian and Judaic, had produced apocalyptic literature and mythology which dealt with the end of the world and of human society. The Epic of Gilgamesh, written ca. 2000–1500 BC, details a myth where the angry gods send floods to punish humanity, but the ancient hero Utnapishtim and his family are saved through the intervention of the god Ea. The scriptural story of Noah and his Ark describes the end of a corrupt civilization and its replacement with a remade world. Noah is assigned the task to build the Ark and save the lifeforms so as to reestablish a new post-flood world. A similar story about the Genesis flood narrative is found in Sura 71 of the Quran, where the Islamic counterpart of Noah, Nūḥ (نُوح ), builds the ark and rebuilds humanity. The first centuries AD saw the creation of various apocalyptic works; the best known is the Book of Revelation (from which the word apocalypse originated, meaning "revelation of secrets"), which is filled with prophecies of destruction, as well as luminous visions. In the first chapter of Revelation, the author St. John the Divine explains his divine errand: "Write the things which thou hast seen, the things which are, and the things which shall be hereafter" (Rev. 1:19). He takes it as his mission to convey—to reveal—to God’s kingdom His promise that justice will prevail and that the suffering will be vindicated (Leigh). The apocalyptist provides a beautific vision of Judgement Day, revealing God’s promise for redemption from suffering and strife. Revelation describes a New Heaven and a New Earth, and its intended audience (Christians under the persecution of the Roman Empire, for whom John wrote the letters that constitute the book) were enchanted and inspired, rather than terrified by visions of Judgment Day. These Christians believed themselves chosen for God’s salvation, and so such apocalyptic sensibilities inspired optimism and nostalgia for the end times. Mary Shelley's novel, The Last Man (1826), is often considered the first work of modern apocalyptic fiction. The story follows a group of people as they struggle to survive in a plague-infected world. The story centers on a male protagonist as he struggles to keep his family safe but is inevitably left as the last man alive. However, Shelley's novel is predated by Jean-Baptiste Cousin de Grainville's French novel Le Dernier Homme (English: The Last Man (1805)). Published after his death in 1805, de Grainville's novel follows the character of Omegarus, the titular "last man," in what is essentially a retelling of the Book of Revelation, combined with themes of the story of Adam and Eve. Unlike most apocalyptic tales, de Grainville's novel approaches the end of the world not as a cautionary tale, or a tale of survival, but as both an inevitable, as well as necessary, step for the spiritual resurrection of mankind. H.G. Wells wrote several novels that have a post-apocalyptic theme. The Time Machine (1895) has the unnamed protagonist traveling to the year 802,701 A.D. after civilization has collapsed and humanity has split into two distinct species, the elfin Eloi and the brutal Morlocks. Later in the story, the time traveler moves forward to a dying Earth beneath a swollen, red sun. The War of the Worlds (1898) depicts an invasion of Earth by inhabitants of the planet Mars. The aliens systematically destroy Victorian England with advanced weaponry mounted on nearly indestructible vehicles. Due to the (in)famous radio adaptation of the novel by Orson Welles on his show, The Mercury Theatre on the Air, the novel has become one of the best known early apocalyptic works. It has subsequently been reproduced or adapted several times in comic books, film, music, radio programming, television programming, and video games. In Argentine comic writer Héctor Germán Oesterheld's comic series El Eternauta (1957 to 1959), an alien race only mentioned by the protagonists as Ellos ("Them") invades the Earth starting with a deadly snowfall and then using other alien races to defeat the remaining humans. Douglas Adams' Hitchhiker's Guide series (1979–2009, with the sixth and final volume written by Eoin Colfer) parodies the same genre of fiction as the 2011 TV show Falling Skies, through having multiple Earths which are repeatedly "demolished", in Adams' series by the bureaucratic Vogons to make way for a hyperspace bypass, much to the chagrin of series protagonist Arthur Dent. Al Sarrantonio's Moonbane (1989) concerns the origin of werewolves (which he attributes to the Moon, which is why they are so attracted to it), and an invasion after an explosion on Luna sends meteoric fragments containing latent lycanthropes to Earth, who thrive in our planet's oxygen-rich atmosphere. Moonbane's tone is reminiscent of Orson Wells' War of the Worlds (1897). The horror manga Hellstar Remina, by Junji Ito, presents a similar premise where an extrasolar, and in reality extradimensional, rogue planet sets a collision course for Earth, destroying several solar systems on the way there, and destroying Pluto, Jupiter, Saturn and Mars as well. It is eventually discovered that the planet is in reality a massive lifeform that feeds on other planets, and is not only alive, but also home to an extremely deadly ecosystem which kills both an expedition force and a group of affluent survivors that escapes to the planets surface to avoid death on Earth. A nuclear response fails, and the planet devours Earth, leading to the extinction of mankind aside from a group of characters surviving in a durable, airtight shelter that is left floating in empty space with supplies and air for a year. Hollywood—which previously had explored the idea of the Earth and its population being potentially endangered by a collision with another heavenly body with the When Worlds Collide (1951), a film treatment of the aforementioned 1933 novel – revisited the theme in the late 1990s with a trio of similarly themed projects. Asteroid (film) (1997) is a NBC-TV miniseries about the U.S. government trying to prevent an asteroid from colliding with the Earth. The following year saw dueling big-budget summer blockbuster movies Deep Impact (1998) and Armageddon (1998), both of which involved efforts to save the Earth from, respectively, a rogue comet and an asteroid, by landing crews upon them to detonate nuclear weapons there in hopes of destroying them. In characters in the six-part ITV television drama serial The Last Train (1999) awaken from a cryogenic sleep after an asteroid, the size of Birmingham, strikes Africa, causing a worldwide apocalypse. The "cosy catastrophe" is a name given to a style of post-apocalyptic science fiction that was particularly prevalent after World War II among British science fiction writers. A "cosy catastrophe" is typically one in which civilization comes to an end and everyone is killed except for the main characters, who survive relatively unscathed and are then freed from the prior constraints of civilization. The term was coined by Brian Aldiss in Billion Year Spree: The History of Science Fiction (1973). Aldiss was directing his remarks at English author John Wyndham, especially his novel The Day of the Triffids (1951), whose protagonists were able to enjoy a relatively comfortable existence with little associated hardship or danger despite the collapse of society. In Spanish Catalan author Manuel de Pedrolo's novel Mecanoscrit del segon origen (1974, Typescript of the Second Origin), two children accidentally survive an alien holocaust that eradicates all life on Earth. They take up the mission of preserving human culture and repopulating the Earth. In Alfred Bester's story "Adam and No Eve", an inventor takes off in a rocket whose propulsion uses a dangerous catalyst. From orbit he sees that the entire world has been destroyed by a runaway reaction caused by the catalyst. Fatally injured in a crash landing, he crawls to the sea so that bacteria in his body can initiate new life on Earth. Richard Cowper's three-volume novel The White Bird of Kinship (1978–82) envisions a future in which anthropogenic global warming led to a catastrophic rise in sea level. Most of it takes place two millennia later. Ursula K. Le Guin's novel Always Coming Home (1985) takes place long after worldwide disasters, apparently largely environmental though nuclear war may also be involved, that drastically reduced the population. It paints an admiring picture of a primitive society that will not repeat the mistakes of civilization. It won the Janet Heidinger Kafka Prize and was a runner-up for a National Book Award. Four decades later, Steve Boyett's novel Ariel (1983, sub-titled "A Book of the Change") has all technology—including electricity, gunpowder, and some physics principles—ceasing to function, while magic becomes real. He also contributed to the 1986 Borderland series, which investigates a return of the Realm of Faery to the world. Roughly a decade later, S. M. Stirling took up a slight variation on this theme in Dies the Fire (2004), The Protector's War (2005) and A Meeting In Corvallis (2006), where a sudden mysterious worldwide "change" alters physical laws so that electricity, gunpowder and most forms of high-energy-density technology no longer work. Civilization collapses, and two competing groups struggle to re-create medieval technologies and skills, as well as master magic. Like Boyett's novel, Stirling's features Society for Creative Anachronism members as favorably disposed survivors, and a hang-glider attack against a building. Afterworld (first aired in 2007) is a computer-animated American science fiction television series where a network of satellites firing peristant electronic pulses, combined with a strange nanotechnology, has not only destroyed most electronic technology on the planet, but also caused the deaths of 99% of humanity, and is now causing strange mutations to occur in lower forms of life. NBC's Revolution (2012–2014) also revolves around a "change" after which the principles of electricity and physics are inoperable. However, the focus of the story is how a group of protagonists try to get the power back on while opposing the efforts of a tyrannical militia leader to understand it first (so that he can take absolute power). The web series H+: The Digital Series (2012) depicts in part, the aftermath of a world in which a computer virus that infected a popular brain-computer interface killed one-third of the population, leading to a breakdown in order and the lack or shortage of electricity and other modern conveniences. The film The Matrix (1999), written and directed by the Wachowskis, describe a future in which the artificial intelligence singularity has destroyed human civilization, and has placed the remaining humans in a virtual reality simulation which is designed to keep them complacent while using them for power. A significant amount of religious iconography pervades the series, including the protagonist being an allegory for the second coming, and the name of the supporting character, Trinity. The film Mad Max (1979), directed by George Miller, presents a world in which oil resources have been nearly exhausted. This has resulted in constant energy shortages and a breakdown of law and order. The police do battle with criminal motorcycle gangs, with the end result being the complete breakdown of modern society as depicted in Mad Max 2 (1981) and after nuclear war as depicted in the third sequel film Mad Max Beyond Thunderdome (1985). The opening narration of Mad Max 2 implies that the fuel shortage was caused not just by peak oil, but also by oil reserves being destroyed during a large scale conflict in the Middle East. The remnants of society survive either through scavenging, or in one notable case, by using methane derived from pig feces. James Howard Kunstler's novel World Made By Hand (2008) imagines life in upstate New York after a declining world oil supply has wreaked havoc on the US economy, and people and society are forced to adjust to daily life without cheap oil. Kunstler's sequel is title The Witch of Hebron (2010). The Walking Dead is a comic-book series from IC and was written by Robert Kirkman, Tony Moore, and Charlie Adlard It was started in 2003 and is continuing as of 2016. The story follows a group of survivors in a post-apocalyptic landscape. The apocalypse in this series was brought about by zombies (here called Walkers), and it is strongly suspected that the Walkers are victims of a virus. The Walking Dead television series is based on the comic books. They have also spawned a motion comic. Kamandi is an American comic book character, created by artist Jack Kirby and published by DC Comics. In the eponymous series, Kamandi is a teenage boy on a post-apocalyptic Earth which the textual narrative describes as "Earth A.D. (After Disaster)". The Earth has been ravaged by a mysterious calamity called the Great Disaster. 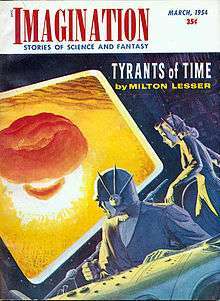 The precise nature of the Great Disaster is never revealed in the original series, although it "had something to do with radiation" (in the series' letter column, Jack Kirby and his then-assistant Steve Sherman repeatedly asserted that the Great Disaster was not a nuclear war, a fact confirmed in issue #35). The Disaster wiped out human civilization and a substantial portion of the human population. A few isolated pockets of humanity survived in underground bunkers, while others quickly reverted to pre-technological savagery. OMAC (Buddy Blank) is a superhero comic book created in 1974 by Jack Kirby and published by DC Comics. Set in the near future ("The World That's Coming"), OMAC is a corporate nobody named Buddy Blank who is changed via a "computer-hormonal operation done by remote control" by an A.I. satellite called "Brother Eye" into the super-powered One-Man Army Corps (OMAC) by the Global Peace Agency (GPA), a group of faceless people who police the entire world using pacifistic weapons. The world balance is too dangerous for large armies, so OMAC is used as the main field enforcement agent for the Global Peace Agency.As envisioned by Kirby, OMAC is essentially Captain America set in the future, an idea Kirby had toyed with some years earlier while at Marvel Comics but had never realized. Xenozoic Tales (also known as Cadillacs & Dinosaurs) is an alternative comic book by Mark Schultz set in a post-apocalyptic future starring mechanic Jack Tenrec and scientist Hannah Dundee. Earth has been ravaged by pollution and natural disasters and humanity survived by building vast underground cities. 600 years later, mankind emerged to find that the world had been reclaimed by previously extinct lifeforms (most spectacularly, dinosaurs). In the new 'Xenozoic' era, technology is extremely limited and those with mechanical skills command a great deal of respect and influence. Killraven (Jonathan Raven) is a fictional character appearing in American comic books published by Marvel Comics. Created by co-plotters Roy Thomas and Neal Adams, scriptwriter Gerry Conway, the Martians from H. G. Wells' The War of the Worlds return in 2001 for another attempt at conquering the planet (later retconned as extrasolar aliens using Mars as a staging area). After humanity's enslavement, men not used as breeders or collaborators are trained and forced to battle gladiator-style for the Martians' amusement; women are used as breeders to supply infants, eaten by the Martians as a delicacy. Jonathan Raven, dubbed Killraven as his gladiatorial nom de guerre, escaped with the help of the gladiatorial "keeper", but without his brother, Deathraven. Killraven joined the Freemen, a group of freedom fighters against Martian oppression. Deathlok is a Marvel comic book character created by Rich Buckler and Doug Moench. Colonel Luther Manning is an American soldier who was fatally injured and reanimated in a post-apocalyptic future (originally given the date of 1990) as the experimental Deathlok cyborg. He verbally communicates with his symbiotic computer, to which he refers as the abbreviated "'Puter". He battles the evil corporate and military regimes that have taken over the United States, while simultaneously struggling not to lose his humanity. Judge Dredd is set in a future Earth damaged by a series of international conflicts; much of the planet has become radioactive wasteland, and so populations have aggregated in enormous conurbations known as 'mega-cities'. The title character is a law enforcement officer in the dystopian future city of Mega-City One in North America. He is a "street judge", empowered to summarily arrest, convict, sentence, and execute criminals. Meltdown Man (SAS Sergeant Nick Stone) finds himself flung into the far-future by a nucelar blast, where the last remaining humans are led by a merciless tyrant called Leeshar and rule over the eugenically - modified animal castes known as 'Yujees'. Accompanied by catwoman Liana, bullman T-Bone and loyal wolfman Gruff, Stone is intent on ending Leeshar's dark reign by leading the slave-like Yujees in rebellion. The AMC television series The Walking Dead, based on the comic-book series, premiered in 2010. It centers around a group of people in the state of Georgia who struggle to survive and adapt in a post-apocalyptic world filled with zombies (called "walkers") and opposing groups of survivors who are often more dangerous than the walkers themselves. The popularity of the series has led to a spin-off franchise comprising an aftershow (Talking Dead), a companion television series (Fear the Walking Dead, a prequel with different characters from the source material), video games (e.g., The Walking Dead: The Game (Season One) and The Walking Dead: Season Two), webisodes (including the The Talking Dead webisodes and the Fear the Walking Dead web series), and numerous parodies and spoofs. Written in 1984, the novel Emergence by David R. Palmer is set in a world where a man-made plague destroys the vast majority of the world's population. The novel was nominated for several awards and won the 1985 Compton Crook Award. José Saramago's 1995 novel Blindness tells the story of a city or country in which a mass epidemic of blindness destroys the social fabric. It was adapted into the film Blindness in 2008. Published in 2003 by Margaret Atwood, Oryx and Crake is set after a genetically modified virus wipes out the entire population except for the protagonist and a small group of humans that were also genetically modified. A series of flashbacks depicting a world dominated by biocorporations explains the events leading up to the apocalypse. This novel was also shortlisted for the Man Booker Prize. A sequel, The Year of the Flood, was published in 2007 followed by MaddAddam, in 2013, the trilogy's conclusion. Richard Matheson's 1954 novel I Am Legend deals with the life of Robert Neville, the only unaffected survivor of a global pandemic that has turned the world's population into vampire zombie-like creatures. The novel has been adapted to film three times: The Last Man on Earth (1964), The Omega Man (1971), and I Am Legend (2007). Jeff Carlson wrote a trilogy of novels beginning with his 2007 debut, Plague Year, a present-day thriller about a worldwide nanotech contagion that devours all warm-blooded life below 10,000 feet (3,000 m) in elevation. Its two sequels, Plague War and Plague Zone, deal with a cure that allows return to an environment that suffered ecological collapse due to massive increases in insects and reptiles. The Scorch Trials and The Death Cure are the last two novels of a series of three (The Maze Runner), by James Dashner which take place in post-apocalyptic United States, in which most of the world population dies of a slowly killing disease caused by a planetary shift. Abomination: The Nemesis Project (1999) takes place in 1999 after the United States has been almost wiped out by a deadly plague. The disease started on the east coast, and communication with the west coast ceased within 72 hours. The last few groups of survivors stopped broadcasting after six days, and the overwhelming majority of the country's population has been wiped out. The player leads a team of eight genetically altered supersoldiers (marines) to defeat an infestation of a global genetic plague which slowly turns into a superorganism. In 1965 the BBC produced The War Game, but it was considered too horrifying to broadcast at the time; it was only in 1985 that it was shown. It portrays a nuclear attack on Great Britain and its after-effects, particularly the efforts of the Civil Defence system. Russell Hoban's Riddley Walker (1980) also has religious or mystical themes. The 1984 BBC television program Threads depicts life before, during, and after the detonation of a Soviet nuclear bomb over Sheffield, England. The Cartoon Network series Adventure Time (which began airing in 2010) takes place a thousand years in a future after a nuclear war (referred to as "The Great Mushroom War") where once existent but eventually forgotten magic is recreated and humans are nearly wiped out with all kinds of creatures that had taken their place. Tom Hanks' 2011 web series Electric City is a story based on a post-apocalyptic world. In this world, a group of matriarchs (the "Knitting Society") impose an altruistic but oppressive society to counter the aftermath of a brutal war that brings down modern civilization. However, in time, even this new "utopian" order is ultimately called into question by the inhabitants of the new society. In Stephen Vincent Benét's story "By the Waters of Babylon" (1937, originally titled "The Place of the Gods"), a young man explores the ruins of a city in the northeastern United States, possibly New York, generations after a war in which future weapons caused "The Great Burning." According to some theorists, the atomic bombing of Hiroshima and Nagasaki in 1945 has influenced Japanese popular culture to include many apocalyptic themes. Much of Japan's manga and anime are filled with apocalyptic imagery. The 1954 film Gojira (1954, Romanized as Godzilla) depicted the title monster as an analogy for nuclear weapons, something Japan experienced first-hand. In Walter M. Miller, Jr.'s A Canticle for Leibowitz (1959) a recrudescent Catholic Church, pseudo-medieval society, and rediscovery of the knowledge of the pre-holocaust world are central themes. Harlan Ellison’s novella "A Boy and His Dog" (1969) takes place in a world desolated by the nuclear warfare in World War III. It was adapted into 1975 a film of the same name as well as a companion graphic novel titled Vic and Blood. David Brin's novel The Postman (1985) takes place in an America where some are trying to rebuild civilization after the "Doomwar" It was adapted into the film The Postman (1997). Jeanne DuPrau's children's novel The City of Ember (2003) was the first of four books in a post-apocalyptic series for young adults. A film adaption, City of Ember (2008) stars Bill Murray and Saoirse Ronan. Fallout, an ongoing series of post-apocalyptic video games first published in 1997, focuses on a world after a massive nuclear war destroys most of the great powers in 2077. The games are usually based around "vaults," safe underground bunkers for long-term survival, and exploring the outside wasteland, in locations such as California, Las Vegas, Washington D.C., and New England. The Fallout series is heavily based on retro 1950s sci-fi, and the setting's technology is mostly frozen in mid-20th century, with vacuum tubes and monochrome screens still being used in most electronics, despite being far more advanced in fields such as robotics and energy weapons. The anime and manga X by Clamp features a supernatural apocaylpse. In it there is a battle over the end of the world between the "Dragons of Heaven" who wish to save humanity, and the "Dragons of Earth" who wish to wipe out humanity. The central character, Kamui Shirō, has to choose which side to fight for. The manga began in 1992 and has been on hiatus since 2003. It has been adapted as an anime film in 1996 and an anime TV series between 2001–2002. The Christian-themed Left Behind series of 16 novels published between 1995 and 2007, and four film adaptions made between 2000 and 2014, posits a world in which righteous believers have suddenly disappeared en masse as they are raptured up to Heaven as the end of times approaches, leaving behind them an increasingly troubled and chaotic world in which the evil Antichrist predicted in Revelations arises to despotically rule over those unfortunate enough to have been "left behind"; he is opposed by newly born-again Christians ahead of the end-times Tribulation. In Ubisoft's videogame I Am Alive (2012), America has gone through a massive earthquake that destroys most cities and areas. Due to the damage of the aftermath, many people are forced to go without resources, causing citizens to become agitated, violent, and bitter, turning them into savage hunters. Many hard rock, heavy metal, and punk bands have post-apocalyptic themes and imagery in their lyrics. Numbered among the bands whose music includes these themes are: Arcade Fire, Marilyn Manson, Metallica, Nine Inch Nails, Nuclear Assault, Radiohead, R.E.M., Slayer, Sodom, System of a Down, The Clash, The Cure, The Doors, The Misfits, and The Smashing Pumpkins. Their work includes various apocalyptic songs across genres. For example, Muse's album The 2nd Law (2012) was inspired by post-apocalyptic life in World War Z, and the event is referred to specifically in the song "Apocalypse Please" (2003). Likewise, the music video for The Sisters of Mercy song "This Corrosion" takes place in a post-apocalyptic setting. ↑ Zimbaro, Valerie P. (1996). Encyclopedia of Apocalyptic Literature. US: ABC-CLIO. p. 9. ISBN 0-87436-823-5. ↑ Barnett, David (25 November 2009). "The discreet charms of 'cosy catastrophe' fiction". Retrieved 6 July 2016. ↑ Guardian book club: Oryx and Crake, The Guardian, April 11, 2007. 1 2 Arthur C. Clarke Award (1 May 2015). "2015 Winner". Arthur C. Clarke Award. Retrieved 20 July 2015. ↑ Murakami, T. (2005). Little Boy: The Arts of Japan's Exploding Subculture. Yale University Press. ISBN 0-300-10285-2. ↑ "Fallout 3 vs. Reality: Photo Comparison". Retrieved 6 July 2016. ↑ "Metro: Last Light review". Retrieved 6 July 2016. "Sub-Genre [sic] Spotlight: Post-Apocalyptic Science Fiction". An overview of the subgenre at Internet Review of Science Fiction.